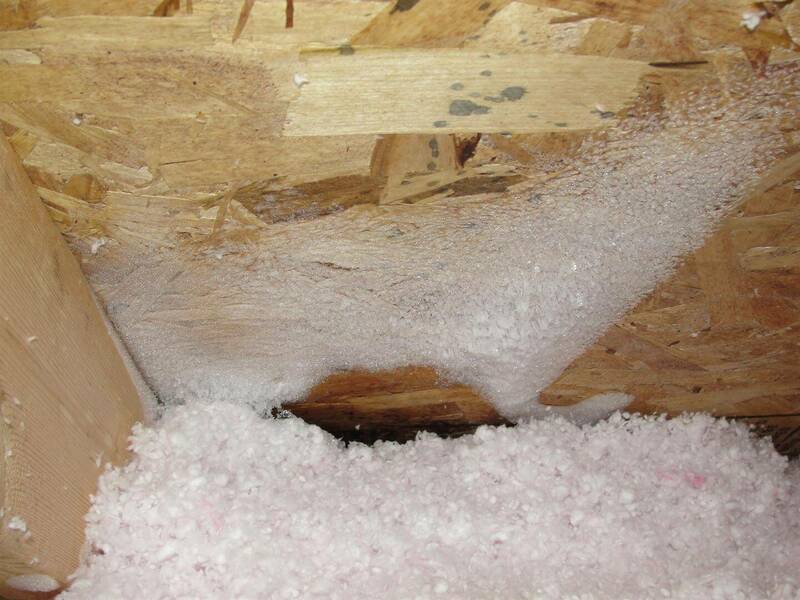 Who inspects the attic insulation in new construction homes? Probably just the person that put it in. Nobody else. When new houses are built in Minnesota, the municipal inspection departments typically never even stick their head up in to the attic after the insulation gets blown in. I know this because I started asking about it. At two recent new construction inspections in Plymouth, we received notice from the builders giving us explicit instructions NOT to open the attic access panels during the inspection. It's their house, so they can do as they want. Heck, home builders can choose to not allow buyers to have home inspections at all... but what do they have to hide? 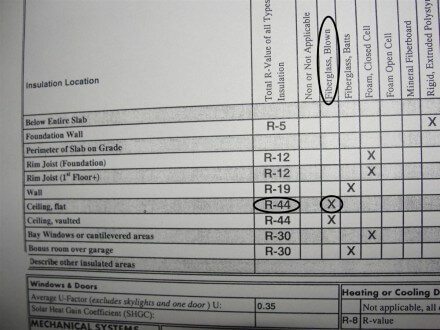 As I've written about before, builders should be proud to have their houses inspected. "Please note: Please do not go into the attic on this home. The attic access is not meant to be gone into for inspections. It ruins the sealed envelope of the home. This is considered invasive and is not allowed per the purchase agreement." The buyer fought tooth and nail to get permission for us to go in to the attic to inspect it, but the builder never backed down. Of course, we respected the builders wishes and left the attic access panel alone. That's how that story ends. The buyer may have us come back out to inspect the attic after they own the house, but it hasn't happened yet. 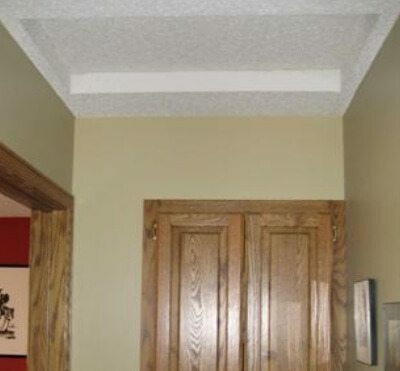 "I just spoke with your home inspector – I let him know he cannot cut the access open to the attic. This is standard protocol for us, we never allow the attic seal to be broken while we own the home. Most home home [sic] inspectors understand this is how it works with new construction. The City of Plymouth has done an Insulation Inspection and have signed off on it. (The Certificate is likely hanging on your garage wall)." I have a hard time believing most home inspectors understand "this is how it works with new construction". All of the best home inspectors I know open the attic access panel to inspect it, even if it means popping open the attic access panel that has been incidentally covered over with a finished surface. Sealed-schmealed. All it takes to 'seal' the attic access panel is about twenty-five cents worth of white caulk. Despite what the builder said, the attic insulation was never inspected by the city, and never does get inspected by the city. They don't look in the attic after the insulation has been installed. 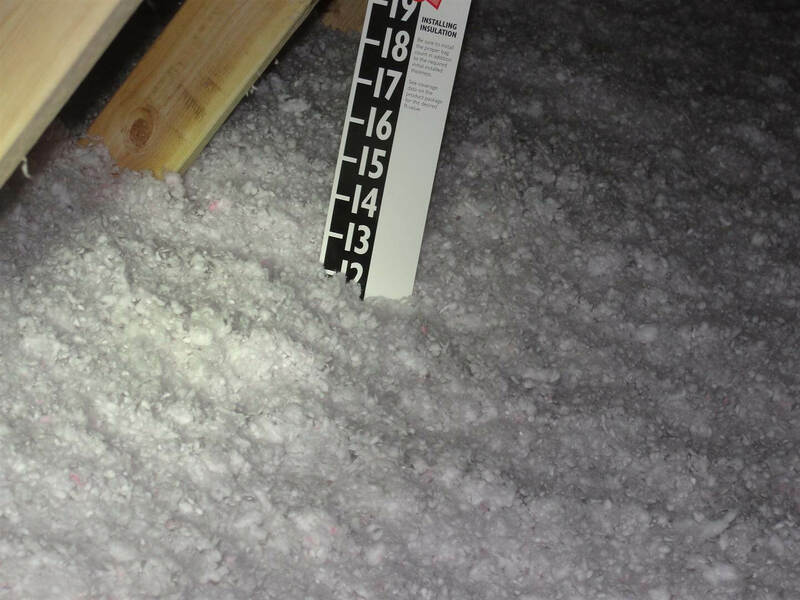 When the municipal inspector signs off on the insulation in the attic, it's standard operating procedure for them to only look at the card in the basement that states the insulation value. That's it. That's all. They're trusting the insulation contractor to get it right. This isn't a knock against Plymouth; this happens all over the Twin Cities. It gets better. Thankfully, the attic in the garage was open to the attic in the rest of the house, and the access to the garage attic was wide open. Well, almost wide open. It was easy enough for me to set a ladder up and climb through. Before inspecting the attic, I checked the card in the basement to find what insulation value was supposed to be present in the attic. It said R-44. 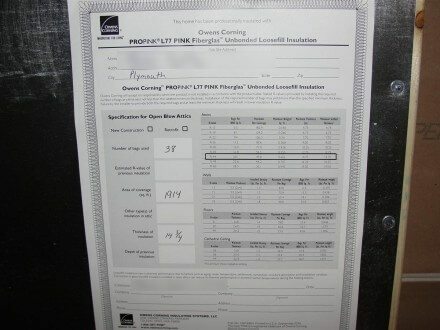 To determine how much insulation is needed to achieve an insulation value for R-44, I checked the attic insulation card. 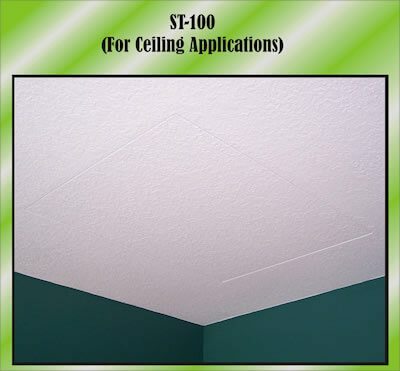 This particular type of insulation requires a minimum depth of 14.75" to achieve R-44. Not maximum depth, not average depth. Minimum. Here's a close-up. 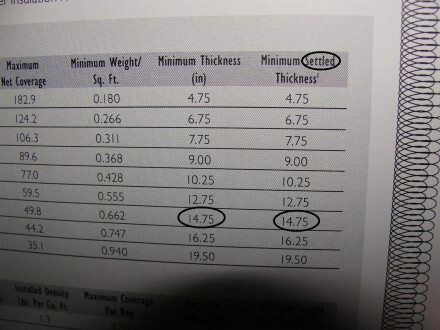 Notice the two numbers given - "Minimum Thickness" and "Minimum Settled Thickness." They're the same. 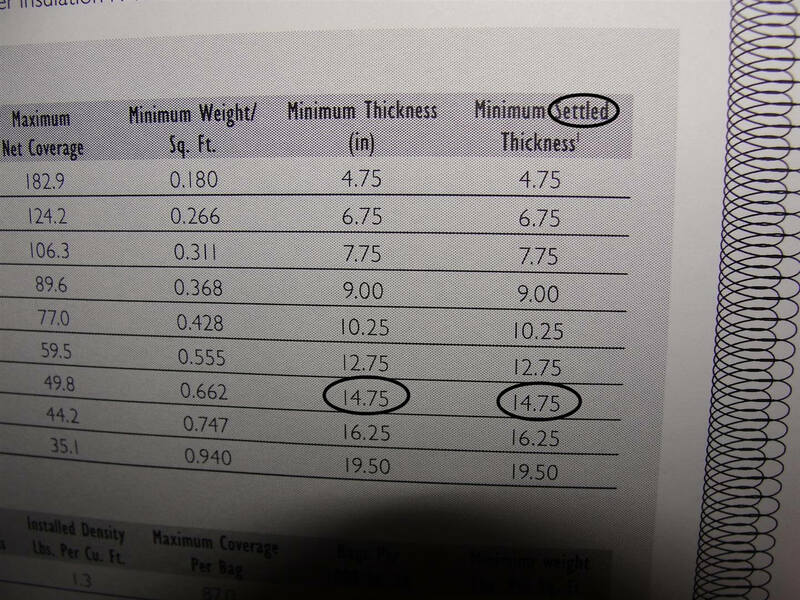 The footnote for the minimum settled thickness says "This product shows negligible settling." I've had many people try to explain to me that the depth I'm reporting isn't relevant because insulation settles so much. That might have been partially true with older insulation, but not the new stuff installed today. I climbed in to the upper attic and found the same thing I find on almost every new construction home that I inspect; insufficient insulation. Far less than 14.75". What was a little different about this attic was that the insulation installer didn't even bother to 'mound up' the insulation around the depth markers to make it look like the proper amount of insulation was used. By the way, the Minnesota energy code requires those depth markers to be placed in every 100 sf of attic space (N1101.4.1.1), and they all need to face the attic opening. The code was written in a way that makes it easy for building inspectors to inspect the attic insulation depth... so why doesn't it happen? I also found a few major attic air leaks, which were allowing for frost to accumulate in the attic, and had already started to turn the sheathing black. If the garage attic hadn't been open to the rest of the attic, how would I have found out about these issues? I'm sure I wouldn't have. This just would have gone on and on until it made a nasty enough mess that there was evidence of it inside the house, and the builder would probably need to deal with it then, many years down the road. It's not tough to make the attic access panel accessible. I've inspected many new construction homes done by local, custom, high-end builders who take the extra time and spend a small amount of extra money to get this detail right. For example, w.b. builders uses a product called SkuttleTight, shown below, left. 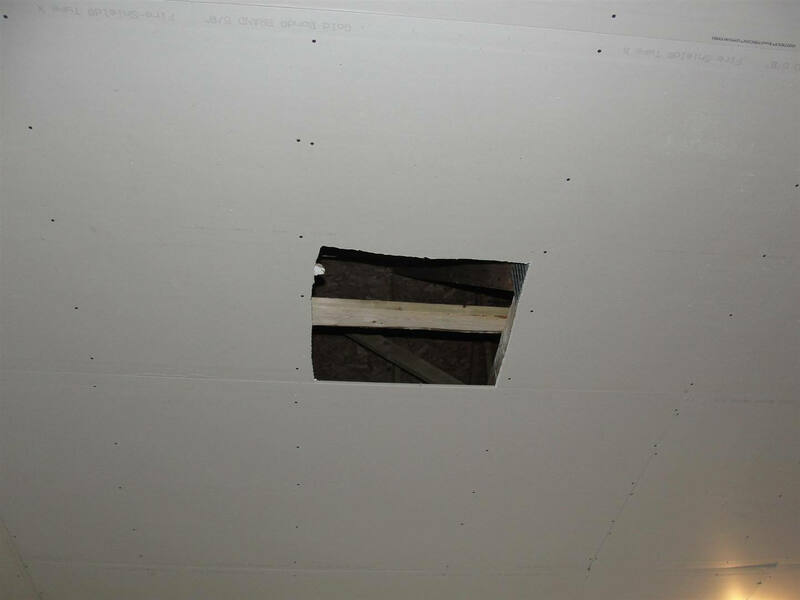 For comparison, the standard attic access cover installed by most large builders is shown below, right. Hmm, which one would you prefer to have on your own house, from an aesthetic standpoint alone? From a functionality standpoint, this product is also far superior to standard attic covers. It makes a nice tight fit at the walls, it has R-40 insulation, and it's weatherstripped to prevent air leaking. The cover can easily be lifted up so the attic can be accessed, and then placed back down and made tight again. It seems to be pretty dummy-proof. All this for about $150, and it's available all over Minnesota. I asked Tim Brandvold at w.b. builders why he uses this system for attics when he could save $150 by just doing what all of the big builders do. He said he does this because it's pretty much a given that someone is going to go in to the attic, and $150 is a drop in the bucket compared to the price of the house. I like his style. If I had my way, every attic access opening would be accessible. I heard a rumor that this requirement will be coming with the newest building code changes in Minnesota. If so, wonderful. Seems to me that the best time to do a new home inspection would be between the day of settlement, which the home owner has posession and the 30 day following. That is if the state mandated warranty period was at least 30 days. That first 30 day period is when our builder's warranty is effective. Following that, it may be a warranty company. Since there's no inspection contingency in new home contracts, buyer's have to accept the home as it's delivered with the county inspection which mean that the county inspectors may have flushed some toilets. That supervisors' comments are pap. I have only had one builder glue the panel down and prevent me from entering. The reason was to "maintain [their] green rating." I told the client to notify him in writing that I would be entering the attic immediately after settlement and take photos. And that your lawyer would be contacting them if what they say is there is not. Somehow they found a way to open the attic for me. And gee, the insulation was insufficient and soffit baffles were blocked with insulation! No way is 15" of blown-in R-44. That's pap too. Oxford - pap worthless or trivial. I have never heard of this happening around here, but some how I think it will. I found the same thing (under insulated attic) on a newer house a few months ago. I blogged about the depth gauge being bent and placed at the farthest point in the attic. Very informative and certainly a concern for new home buyers. We shall look up that Scuttle Tight product and see if it is available in our area. You are to be commended for looking out for your client's interests! I once had a developer make a big point out not allowing me to open the electrical panel. I said not seeing inside the panel would be part of my report. My client was standing right there. He borrowed my screwdriver and opened the panel for me. There was nothing wrong with the panel or the electrical work, so I said so. Funny, he didn't offer to but the cover back on. I'd have let him borrow my screwdriver, no problem. Good information in your post. 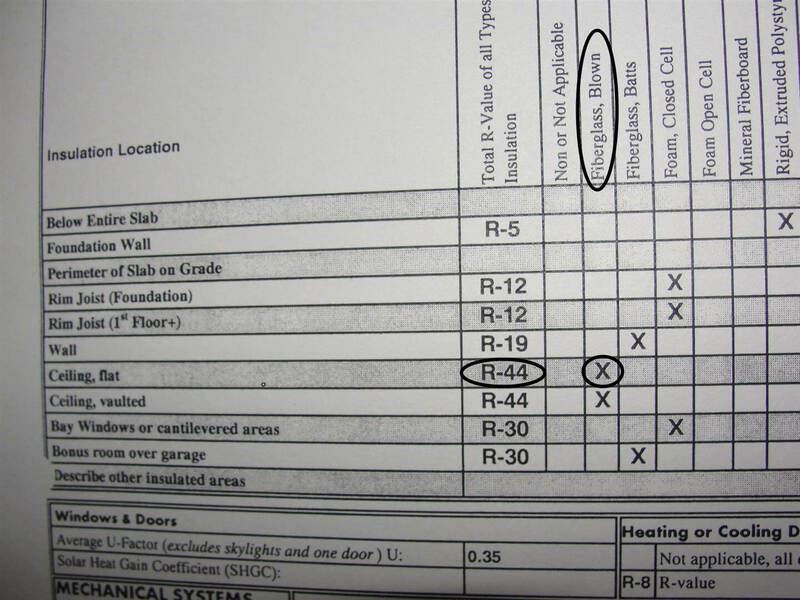 It seems that an entire building should be inspected by qualified people. Here I inspect every new home built by several builders. We have adopted the 2009 IECC. If there is not 14.5" of insulation it goes on my report which has to be given to the AHJ before the COA is issued. The builders are also required to have a gasket at the attic hatch as well as it be insulated. There is no caulking seal to break. If I was a buyer I would open the hatch myself. What are they going to do? Not sell it to me? Lenn - here in Minnesota, that warranty lasts for a year. We do a fair number of inspections during that period, but I've found that builders seem much quicker to respond to issues when they haven't yet been paid. Jay - thanks for including the dictionary definition :) I like it. It's quite rare for us to not have access to a new construction attic, but twice in a one week period was just strange. James - I remember that one. Dirty, dirty trick. Sharon & Bruce - thanks. Donald - that's a good idea. The next time I find insufficient insulation in the attic I'll be notifying the AHJ. Robert - too funny. Electrical seems to be one of the few items with new construction homes where I rarely find any defects. Rob - we'll be adopting the 2012 IECC here in Minnesota; once that happens, I suspect the attic access panels will be much easier to remove. Nice post Rueben! In our area builders only guarantee the structural integrity of the home. The subcontractors are responsible for anything defective pertaining to their work. Problems may arise if the issue involves several subcontractors. In the porland oregon and surrounding areas I have found multiple new homes with missing areas of the home that did not have any insulation in them or even the entire attic missing insulation. Yikes, I've seen attic inspections where the ventilation was not adquate or the dryer vent ended in the attic. The plywood up there was covered in mold. The Sellers, of course, never knew. It was a shock and an expensive remedy. A good inspection is worth every penny. Post © 2019 Reuben Saltzman, Delivering the Unbiased Truth. (Structure Tech Home Inspections). Design © 2019 ActiveRain, Inc. All rights reserved, Inc.